IT HAPPENED AT THE BALL... Where beautiful but bold Lillian Bowman quickly learned that her independent American ways weren't entirely "the thing." And the most disapproving of all was insufferable, snobbish, and impossible Marcus, Lord Westcliff, London's most eligible aristocrat. IT HAPPENED IN THE GARDEN... When Marcus shockingly - and dangerously - swept her into his arms. Lillian was overcome with a consuming passion for a man she didn't even like. Time stood still; it was as if no one else existed...thank goodness they weren't caught very nearly in the act! IT HAPPENED ONE AUTUMN... Marcus was a man in charge of his own emotions, a bedrock of stability. But with Lillian, every touch was exquisite torture, every kiss an enticement for more. Yet how could he consider taking a woman so blatantly unsuitable...as his bride? Wonderful! 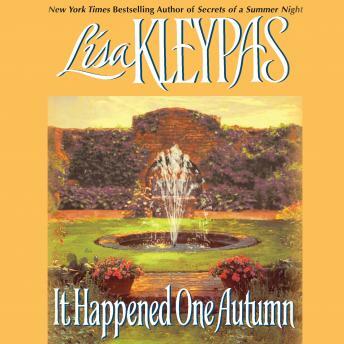 Another great listen from Lisa Kleypas! I just love her books! I highly recommend!